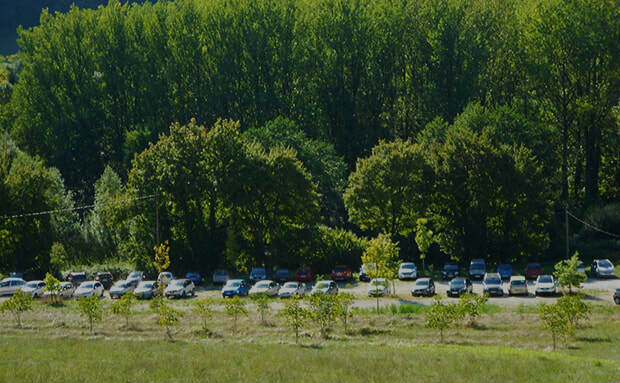 The weekend was a great success with more than 300 visitors over the two days. 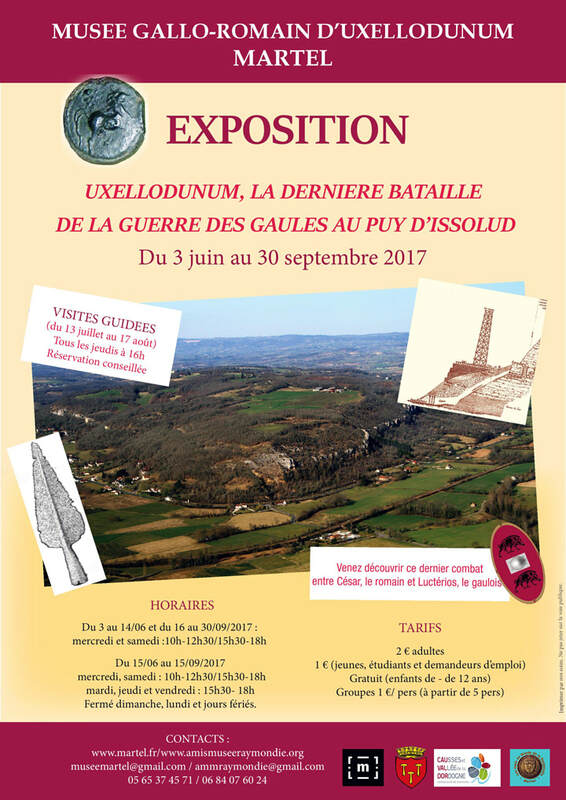 This two-day exhibition was created by Jean-Pierre Girault and the Association of the Amis d'Uxellodunum with the participation of the Syndicate responsible for the site, the SMGSU. 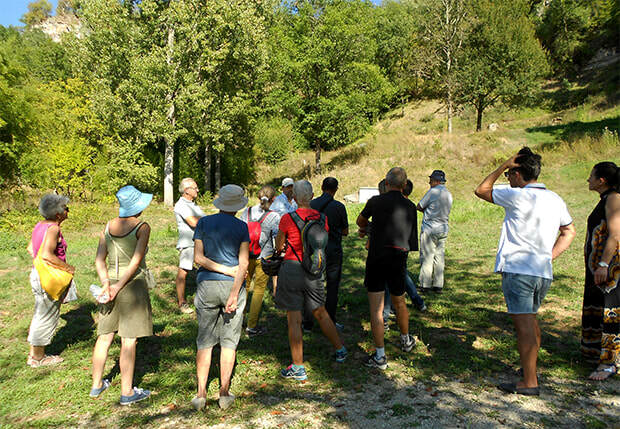 In addition, on Sunday, May 13, Jean-Pierre Girault led a guided and commented tour. 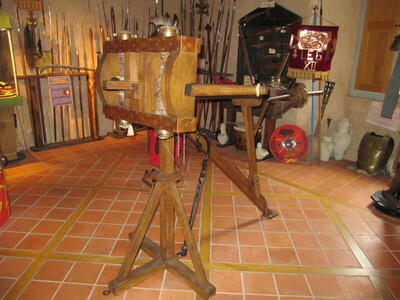 As well as presenting the old and recent archeological excavations, this exhibition enabled visitors to discover some of the material acquired by the association of the association with the support of Crédit Agricole de Vayrac, the municipality of St-Denis-lès-Martel and the SMGSU - equipment acquired from Pascal Lavaud, the last ancient tool maker in France, now no longer in activity, with in particular a catapult as well as a showcase of Roman armaments. Seventy former excavators of Uxellodunum and other stakeholders met on 1st April 2018 to celebrate together more than 20 years of archaeological work conducted collectively on the site of Puy d'Issolud under the direction of Jean-Pierre Girault, archaeologist. 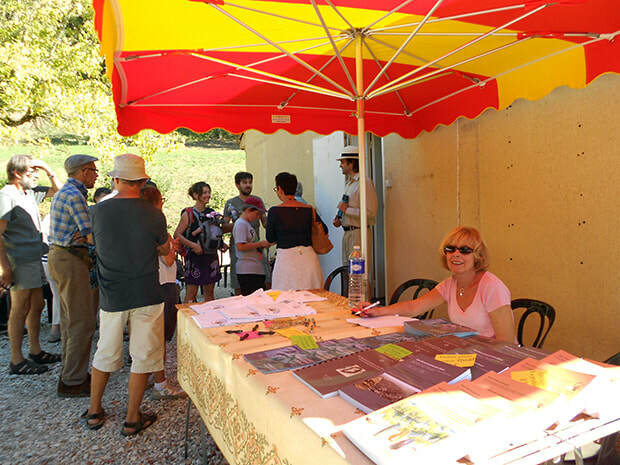 Thanks to all these efforts, under Jean-Pierre Girault's very competent leadership, Puy-d'Issolud, a major site of national history, was formalised on 26th April 2001 by the Ministry of Culture as being the site of Uxellodunum. described by Caesar in La Guerre des Gaules. A picnic lunch was followed by a walk to the site. The sun, shy so far this year, shone brightly on Puy d'Issolud. The evening meal was accompanied by movies, songs, stories, and slideshows. We celebrated together the great adventure of Uxellodunum. - to fly the flag of Uxellodunum and to enable a development of the site that is both reasonable and respectful of its fragility. - to promote the progressive migration of the Uxellodunum project to the services of Cauvaldor. - to end this period of uncertainty, not to say, stalemate. - to bring the different partners involved to the table and to give each their legitimate place in a calm and positive relationship. Despite everything, important progress has been made during this period. 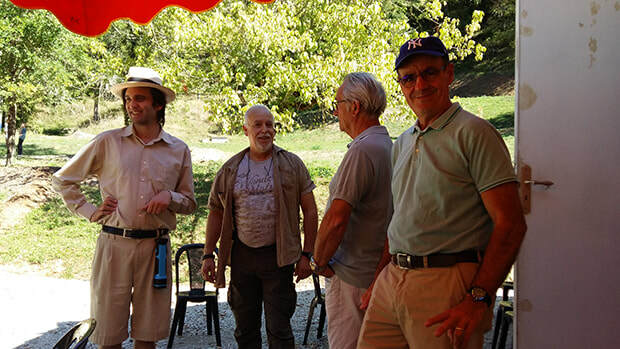 At the firm request of the network of associations, a Scientific Committee has been set up under Vincent Guichard, Director of the European Archeological Centre of Mont Beuvray, whose competence in the archeological domain is universally recognised. In its meeting on 2 February 2015 the Committee proposed that a number of works, already agreed by the S.M.G.S.U. in the past, should be carried out. A grant (Dotation d’Equipement des Territoires Ruraux or D.E.T.R.) was agreed in 2015 by order of the Prefect, and the works must be carried out in the first quarter of 2018 with the objective of repairing, restoring, safeguarding and preparing the site in order to allow a progressive opening to the public during 2018. In this context, in part due to its longevity, its legitimity and its recognised knowledge of Uxellodunum, our Association is keen to increase its participation at the heart of the associative network, in order to contribute fully to the re-opening of the site. 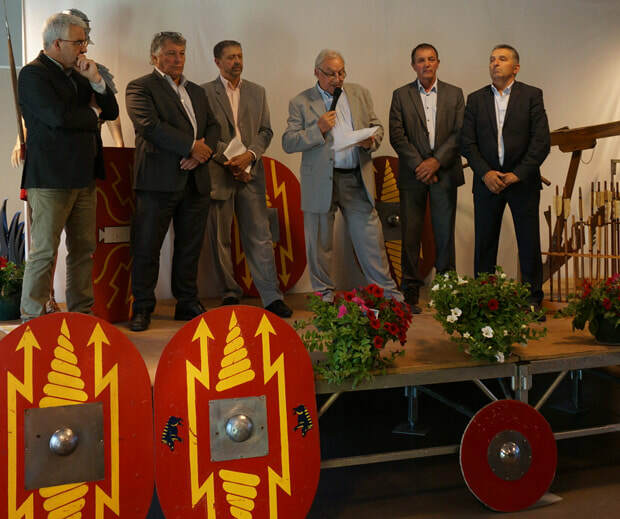 In 2017, we supported the association of the Amis du Musée de la Raymondie (Friends of the Raymondie Museum of Martel) and contributed to the new publication on the battle of Uxellodunum written by Jean-Pierre Girault, without whom the question of Uxellodunum would not be on the agenda. In 2018, we are preparing an exhibition covering the past and recent archeological excavations of Uxellodunum. It will be held in the Salle Mathieux in Saint Denis les Martel at the end of May. We are also working with the Scientific Committee on the preparation of an audiovisual presentation on the battle of Uxellodunum destined to welcome the public to the maison de la fontaine on the site. In addition the association is investing financially by purchasing the catapult built by Pascal Lavaud. 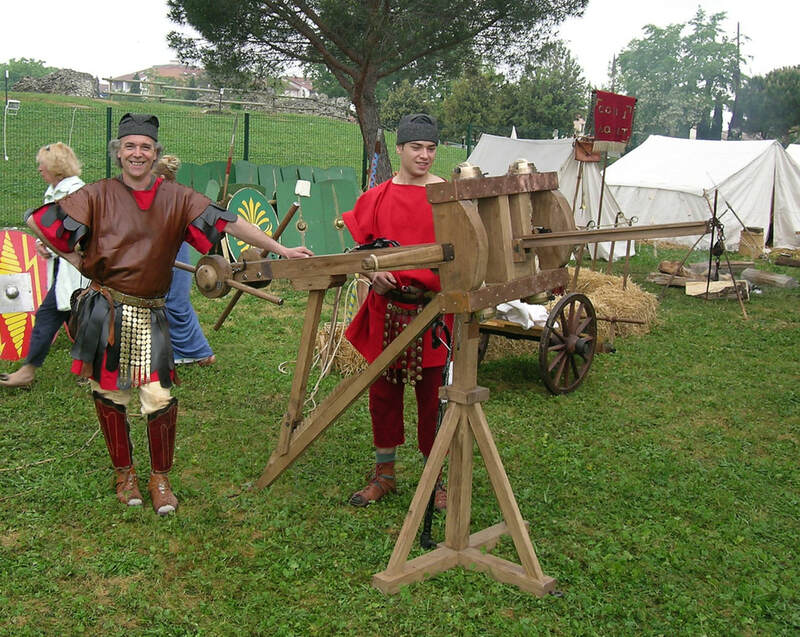 This full-sized working reconstitution of a Roman scorpion was used on the site during the firing trials carried out in 2006. The trials contributed to the localisation of the tower constructed by the Romans. 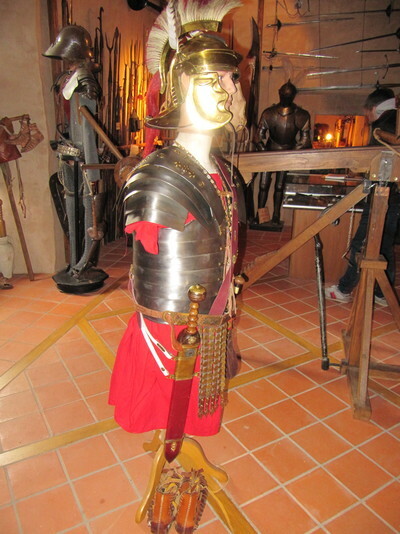 Other items such as shields, armour, roman helmets, a tent, a lance, a pilum, a gladiator sword and arrows are being returned to us and could be exhibited in the maison de la fontaine in the future. The adventure of Uxellodunum is amazing and I invite all those interested in history to join us. We are entering, full of optimism, into a phase of activity. I take this opportunity to wish you all a somewhat belated Happy New Year 2018 ! On sale in the Raymondie Museum in Martel, price 7€. The actual location of the siege of Uxellodunum, the last important battle of the Gallic Wars in 51 BC, generated very early debates. But, unlike the other important sites evoked by Caesar (Gergovie, Alesia ...), the question was still unresolved 25 years ago, for lack of recent research on the site of Puy d'Issolud. From 1993 onwards, an ambitious research program was set up in the framework of annual, multi-annual, and programmed operations authorised and financed by the Ministry of Culture. 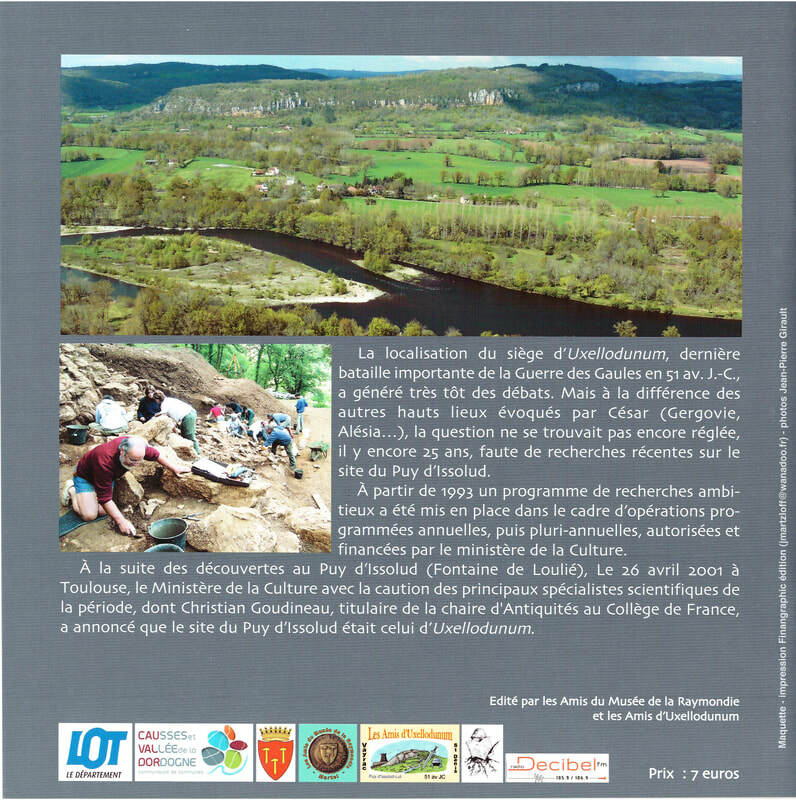 Following the discoveries at Puy d'Issolud (at the Loulié spring), on 26 April 2001 in Toulouse, the Minister of Culture, with the backing of the main scientific specialists of the period, including Christian Goudineau, chair of Antiquities at the Collège de France, declared the Puy d'Issolud site to be that of Uxellodunum. This new booklet was published in June 2017 by the Friends of the Raymondie Museum and the Friends of Uxellodunum. Following the Extraordinary General Meeting in 2015, which made it possible to seal our partnership with the association Racines - an active partnership within the framework of a convention - the current objective of the association is to comply with the requirement to propose a new Board of Directors. Roger Mialet presented the annual report, which was adopted by a majority. The report described a significant decline in the number of members following the many defections of people tired of the incessant fighting, plus the political and local attempts of appropriation. In spite of everything, we are still in a certain way the living memory of the site of Uxellodunum at Puy d'Issolud since its formalisation by the Ministry of Culture in 2001. For the most part we know the history well for having experienced it and our investment has always been important and disinterested. A few important elements during this period make it possible to better understand the situation. First of all, the numerous national and local elections have caused a certain amount of turbulence within the Syndicat (S.M.G.S.U.). The presidency has successively changed from that of Louis Crémèse to that of Dominique Lascaux, then of Pierre Verdier, returning again to Hugues Du Pradel and finally to Alain Reinat, former vice-president of our association. Now that he has taken office we can reasonably expect the situation to stabilise in order to create the conditions for an active and peaceful partnership. Despite this period of uncertainty, significant progress has nevertheless been made. 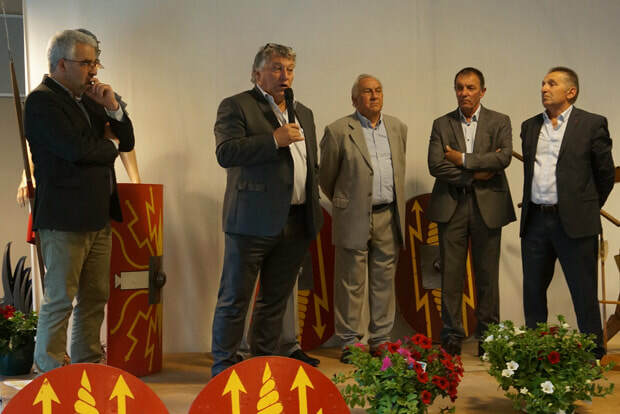 At the strong request of the associative network, a Scientific Committee has been created under the authority of Vincent Guichard, Director of the European Archaeological Centre of Mont Beuvray, whose competence in the archaeological field is unanimously recognised. This committee, in its meeting of 2 February 2015, proposed a number of works that were validated by the SMGSU of the time. 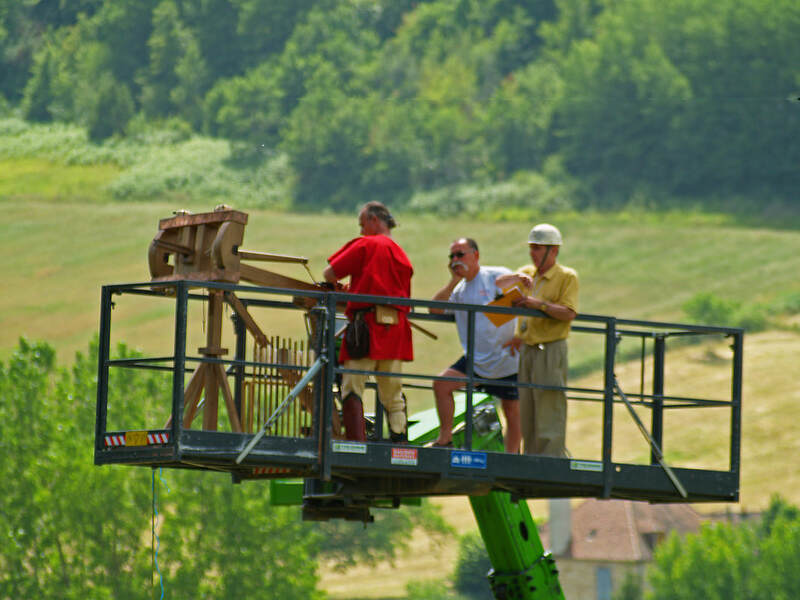 This work was the subject of a DETR : Dotation d’Equipement des Territoires Ruraux (Equipment Assignment for Rural Territories), that was accepted in 2015 by a Prefectoral decree, the work to be carried out quickly so as to repair, restore and develop the site to allow a progressive reopening to the public. The aim of a reopening in the context of the Journées Européennes du patrimoine (European Heritage Days) in September 2017 may seem a bit ambitious but is still relevant. At the moment work is being done or has been carried out and the site is gradually regaining the aspect that it had when this association maintained it. One can only rejoice. That said, we can never repeat enough that it is thanks to Jean-Pierre Girault's work that the question of Uxellodunum is at the heart of our concerns. But in the end, what remains of the site's memorable officialisation of 26 April 2001, already 16 years ago, in spite of everything? 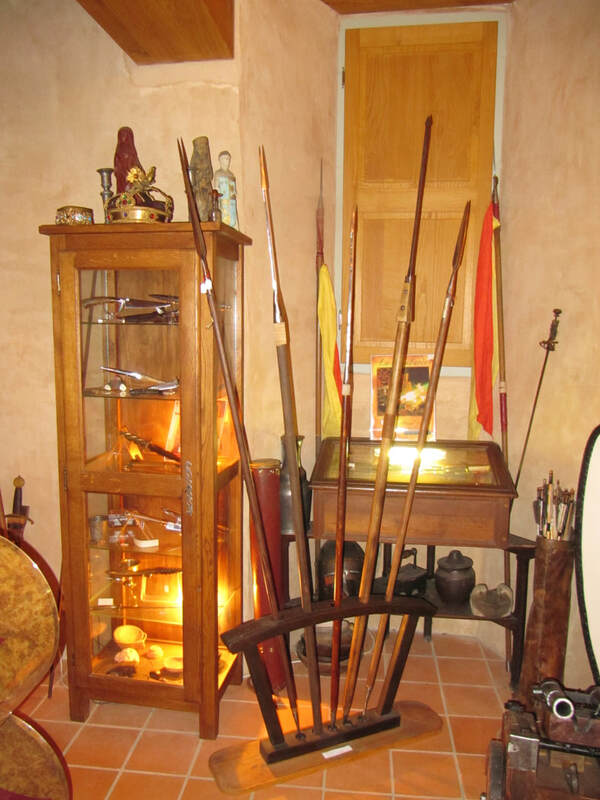 There are a number of publications and a website, uxellodunum.com, which is a veritable mine of information and brings together almost all the recognised and validated scientific knowledge on the subject even if many questions remain unanswered. This work deserves further specific, complementary research. Scientific knowledge is the launching pad of the Uxello rocket. Under the impetus of the Association des Amis du Musée de la Raymondie, the museum of Martel opened to the public in 2015, and this year inaugurated an excellent permanent exhibition on Uxellodunum, which contributes to the valorisation and knowledge of the site, even though a harmonisation with the museum of Vayrac would be logical. A centre of knowledge, open to the public and bringing together some of the objects and artifacts found on the site is the second stage of the Uxello rocket. And then there is the site strictly speaking without which nothing exists, this site of Puy d'Issolud and more particularly the site of the Loulié spring in our commune (Saint-Denis-lès-Martel), in the heart of our territory. This site has been extensively disturbed, by the various excavations and its variety of uses, more or less controlled. It is on this site that most efforts must be concentrated today to allow it to be opened to the public in a realistic way and also to enjoy lasting protection. This is the third stage of the Uxello rocket. 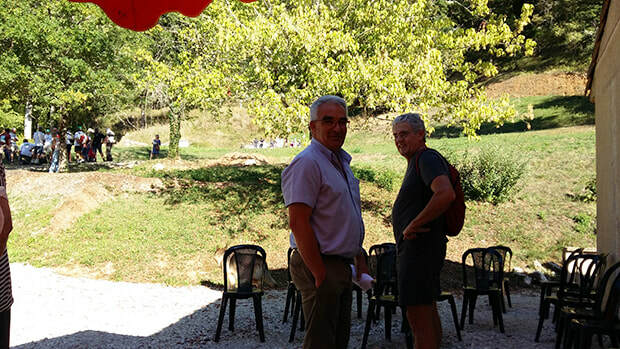 ... and if we are not able to put our egos aside and our sensitivities on the back burner, to work collectively in mutual respect, then we take the risk of definitively compromising any form of development of this major archaeological site thus depriving the territory of a potential tourist and economic springboard. This is why our association has confidence in Alain Reinat, President of the SMGSU to carry the colors of Uxellodunum and finally enable reasonable and considered development, respectful of a fragile site, to help clear the record, to give appropriate legitimacy to each of the various partners, and to encourage a gradual migration of the development of Uxellodunum to Cauvaldor, this while remaining determined, vigilant and cooperative. Alain Reinat reminded those present of the events, work in progress, and priorities. He asked for an update on the assets of the association, bearing in mind that a subscription has been launched with the Fondation du Patrimoine. During this period we have worked in partnership with the association Racines, created links with others and supported the association des Amis du Musée de la Raymondie. The financial report for the past year was presented by the treasurer, Monique Couret and received no comments. It was validated by the auditors. This financial report shows a positive balance at the end of 2016 of €11090.81 plus a number of assets, in particular a website and the ownership of a number of domain names which we have funded since their creation, such as Uxellodunum.com, .net, .eu, but also a collection of Jean-Pierre Girault's publications ranging from the Bronze Age to Prehistory, the Middle Ages, the Gallo-Romans, the official publication of Mont Beuvray, and booklets on the battle of Uxellodunum, sculptures from the 2012 symposium, a gate enabling access to the site, invoices for works to restore the wash house and wall, invoices for the excavation and treatment of excavated material, purchase of a cage containing the pebbles that served as projectiles in the course of the battle. 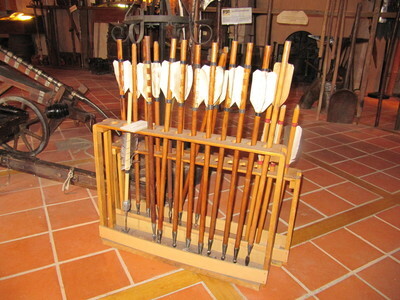 A brush cutter was offered by the Syndicat in 2005, the saw having been destroyed during construction work. And, finally, a set of roadside signs on Uxellodunum were erected around the site as well as a number of T-shirts and small objects. The meeting continued with the vote in favor of the candidates to the Board of Directors. Georges Couret, Patrick Lascaux, Christian Missoty, Monique Couret, Didier Bertrand, Francine Bonati, Alain Parayre, Jean-Jacques Rougié, Caroline Mey-Fau and Roger Mialet. Pierrette Tovena and Christian Delpy. The new Board of Directors then fixed the membership fee at €15. 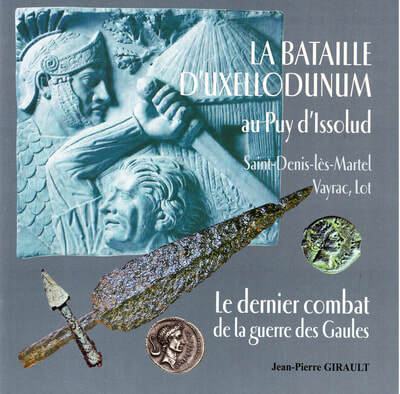 This year the brochure "The battle of Uxellodunum", published with the Association des Amis du Musée de la Raymondie at Martel, will be offered to members. To continue the reflection on the creation of a slideshow to present the battle in audiovisual form, in collaboration with the Association Racines and their archaeology group. A concerted reflection on the improvements to be made at the level of the house and the fountain in order to allow visits by the public. Participation in the implementation of the work undertaken by the SMGSU. Contribution to the organisation of open days if the conditions are met. In collaboration with Jean-Pierre Girault and Suzy Ireland, continuing to update the website. This 15th General Assembly ended with a drink, the participants agreeing that it had been fruitful and marked by a spirit of openness and optimism.